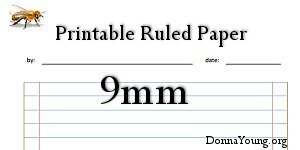 Just for the purpose of donnayoung.org, let's define filler paper as paper with plain or mostly plain lines that you can print, hole-punch, and place in a binder. Of course, hole-punching and placing in a binder is entirely optional. If you need handwriting rule go to the two sections Handwriting and Blank Top Handwriting. I have been asked – I do not sell pre-printed filler paper. Basic Usage – The files here may be opened in your browser and printed with your printer for your students, your children, or yourself. Please do not upload any of my files to a server, web site, forum, blog, email, etc. If you want others to know about the files here, please share the links to my website pages. View the links below to see what sort of filler paper that you can print from DonnaYoung.org. 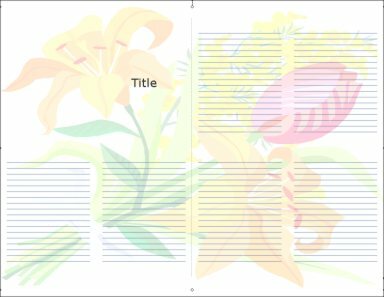 This page offers two filler papers. 1. A basic filler paper that prints black and white. The paper has defined ruled margins and comes in several rule heights. 2. A special filler paper that has short tick marks evenly spaced along the ruled lines. This "spacer" paper prints in blue and pink with a defined unruled margin. The filler paper at History Themes consists of "President Paper. "The paper is ruled and features a small image of the president in the upper right corner. Choose from numbered rule or plain rule. The blue-ruled paper on this paper has a small image depicting something from the listed books below. The blue-ruled paper on this page features various animals. Miscellaneous describes the ruled paper here. The images decorating these papers vary from super heroes to trees. Math Paper is devoted to special filler that is designed for the student who has gone from workbooks to textbooks. I designed the paper to help the child produce a neat paper. One design includes the multiplication table written around the border. Coordinate Grids for Math has files that are meant to become an entire notebook for the student who is studying algebra. Homeschool planners contains mostly forms but we have filler paper in homeschool planner! For more files designed for use in half-sized binders see related links at Booklets.